For the past few years I have been keeping very detailed records of most parts of my operation. The reason for these records are to analyze what we have done, and come up with solutions for improvement. This gives me a ton of info that I can analyze to really see what is happening out there on my course. I can even compare employees to each other to see who is more efficient at each job. This combined with each person's wage gives me a very good idea of what the actual cost of each mowing task really is. Even though I am the most efficient operator at my course, my higher salary make it much more expensive to the club for me to operate a mower. 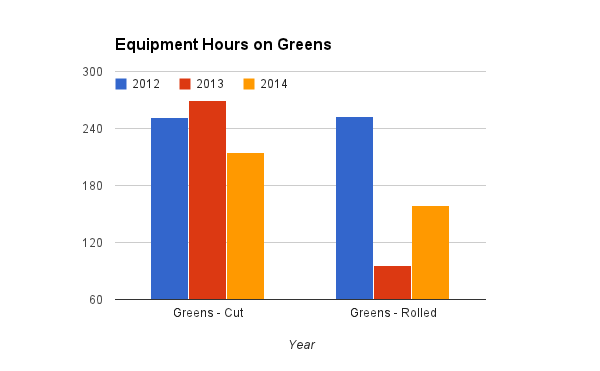 One of the biggest costs for golf course maintenance is mowing the grass. Ideally we want to mow the golf course as little as possible to achieve the desired turf quality and we also want our mowers to cut the grass as quickly as possible. Cutting grass quickly doesn't necessarily mean running the mowers at a faster speed, it means operating the mowers in a way that is more efficient. The following chart illustrates the total amount of times each process took place. Now you're probably wondering why did we roll so little in 2013? The reason for this was staff levels. We were short staffed and had an inefficient staffing schedule and were not able to roll as often as we would have liked. With the data collected last year it was obvious that I had to make changes in order to achieve my goals of rolling daily and mowing every other day. By combining the data from the first 2 charts I can get an idea of the efficiency of each operation for each year. Now the issues with 2013 become clearer. We were incredibly inefficient in our operations. So why were we so inefficient in 2013 and how did I increase this efficiency in 2014? In 2013 I had a staff of 3 all working full time shifts. Because we didn't have the staff numbers to do all the required daily task starting from the beginning of our shifts, we were often forced to work on the greens when there were golfers on the course. Working on the greens with golfers present drastically increases the time it takes to do the job and I had an inexperienced staff. It also takes away from the golfer experience. With this collected data I was able to identify the problem and come up with a plan to make it better. If I was able to increase my staff by 1 person I would be able to become more efficient with my daily tasks. The only problem was that I didn't have the budget for any additional staff! What I decided to do was hire 2 part time employees instead of 1 full-time employee. This would give me an extra body in the early mornings when most of the mowing took place. We would be able to get all the tasks on the greens done quickly and would not have any golfer interference. This also freed up my one full time employee to start mowing fairways and rough early in the am further reducing golfer/mower interactions. I was also lucky to get back an experienced employee that had taken 2012 off. With this small change I was able to keep my labor budget the same, and get a lot more done! The following chart illustrates that even though I put less time into the course this year I was still able to get everything accomplished with the highest efficiency ever achieved on this course! I can do the above comparison for every aspect of the operation. 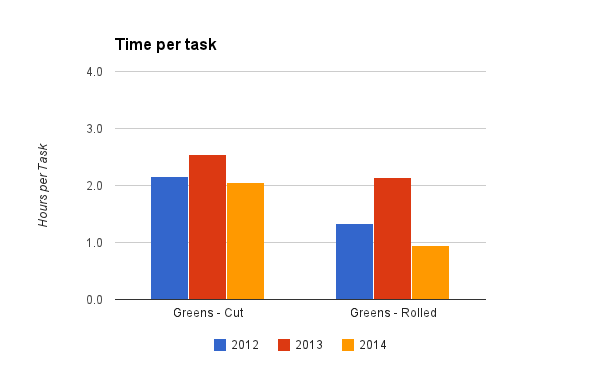 Chart 5 below shows the efficiency of my mowers over the past 3 years. As you can see, I was able to get the most efficient operations on greens and tees ever. 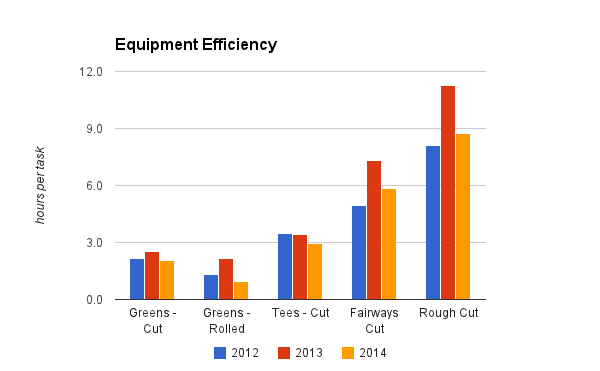 For fairways and rough I was able to drastically improve on the efficiency of 2012 but it still wasn't my best effort yet. 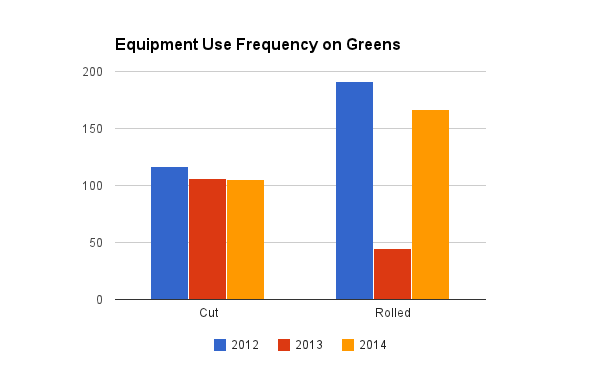 I think the reason for this is that the new fairway mower is slightly slower and we had to further reduce the speed of it due to the fact that its reels are not as durable as the mower we had in 2012. 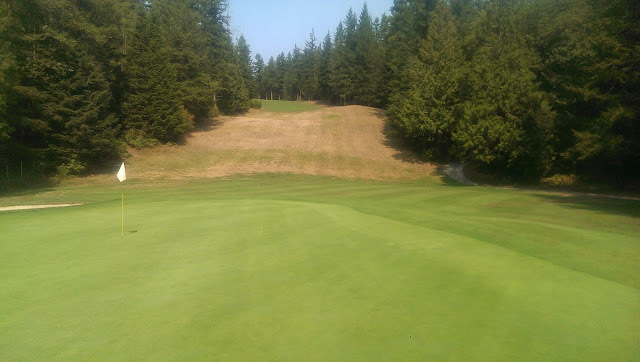 We were still able to increase our efficiency simply by mowing when golfers were not on the course. 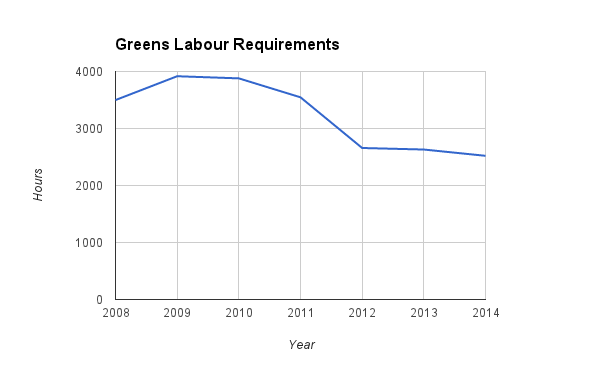 Rough took a bit longer than in 2012 because we are now mowing more rough than we used to. I decided that with the increased efficiency I would cut the rough more frequently to increase the quality of the course. This is just a small portion of what this data can help you do to refine your operations. Without the data all you can do is guess. EIQ Tracking, My First Year.